Incepted in the year of 1977, We, M.G.M. & Company, are engaged in manufacturing, supplying and exporting Diamond Polishing Dops, with certification of ISO 9001:2008. 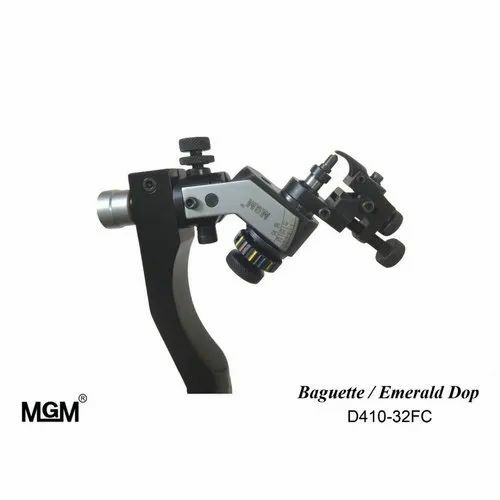 Under this range, we offer Diamond Polishing Dops like Bottom Dop, Top Dop, Star Dop, Girdle Polishing Dop, Fancy Dop, Emerald Dop, Baguette Dop, Marquise Dop, Table Dop and Allied Products like Eye-Loupes, Diamond Polishing Tang etc.. With the deep commitment towards, we manufacture all our products using high-grade basic material such as iron, stainless steel and required alloys, that we procure from the established vendors of the industry. We ensure to follow established quality guidelines during each stage of production to develop products with impeccable attributes. Along with this, the range diamond cutting and polishing tools is being ergonomically designed keeping mind required precision during cutting those hard stones. Our this range ensure high grinding efficiency, low grinding force, resistance against wear and longer serviceability. Our organization has been supported by a team of highly qualified and skilled professional, which fosters us to bring forth the best-in-class range of products. Our professionals are capable enough to develop products in accordance with the market trends and established quality benchmarks. All our professionals are dedicated towards innovation so as to develop more efficient products. Along with this, we have a sound production unit which is erected with machinery based on advanced technology, fosters us to complete projects with efficiency. Apart from above, with our continuous improvement and innovation we have been able to exceed expectation of clients based across the market of Indian Subcontinent, Middle East, South America, South/West Europe and North America. Along with this DOOR EYE, DOOR VIEWER; Matt Silver Door Viewer, Brass Antique Door Viewer and Matt Gold Door Viewer and EYE LOUPE, DIAMOND LOUPE, GLASS LOUPE.